All the trains were packed, and commuters were stranded. Many gave up entirely and went home. The situation was made worse as SouthEastern proceeded to cancel all metro services that night (lines closed around 8pm) and implement the same severely limited timetable today and, as it stands, tomorrow. You can read far more comprehensive accounts of the failure at Londonist here and 853 here. “Network Rail and the train operators (in this case Southeastern) have agreed contingency plans in place to operate train services in extreme weather conditions. In severe winter weather running a reduced service allows us to respond to any incidents quicker, with the intention of resolving them before they have a significant knock-on impact on other services. We do everything we can to reduce the risk of passengers being stranded on trains which can happen quickly when the network is operating at normal levels. Both Network Rail and the train operators also face the challenges of moving staff to where they need to be to do their job, particularly when the road conditions are as severe as they are at present. I’ve asked the company – whose press office has, I should add, beem prompt and helpful – why Network Rail and SouthEastern have implemented such drastic cuts while other services in far more snowy areas are carrying on regardless, and will update when I get a reply – hopefully tomorrow. Quick update: Transport Minister Paul Clark MP has said he’ll be writing to SouthEastern to ask for a meeting with management. I’ve raised the obvious question, but please do pass on any others. “A one-size-fits-all approach wouldn’t work in these circumstances. The contingency plans in place take into account a wide range of factors specific to each route including the characteristics of the railway infrastructure itself and the type of trains which run on it. We can assure your readers that Network Rail and Southeastern are working hard to run as many trains as possible and the plans in place aim to achieve this. We will continue to review the effectiveness of the plans and if we identify a way to improve them further, we will do so. In addition to the volume of snow on some parts of the network, we have also experienced some problems as a result of the prolonged freezing temperatures which have been experienced in Kent. 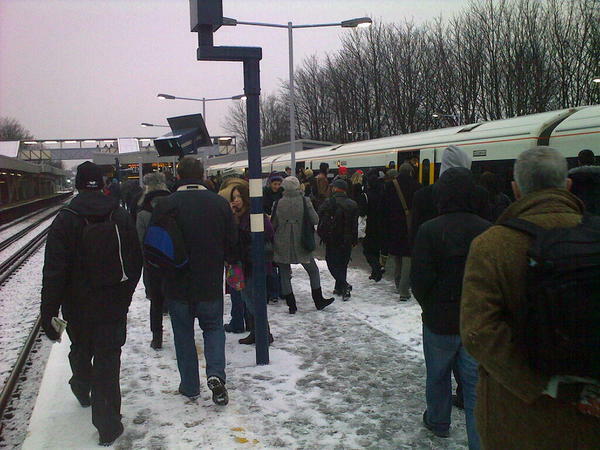 The third rail electrification system used to the south of the capital can be susceptible to this sort of weather, especially when combined with rain or melting snow. Special trains which spray hot de-icer fluid on the tracks/third rail and empty trains, known as ‘ghost trains’, are run across the network to try and prevent ice forming, however, if ice does form it can interfere with the power systems on the trains and cause significant disruption. Thanks for posting this reply. I read it and re-read it a few times and I still can’t find a reason for the disruption. I think that “if ice does form it can interfere with the power systems on the trains and cause significant disruption” is the closest thing to an explanation that they managed. And also implied in the reply is the solution: run trains often. It’s a spectacular display of lack of judgement.